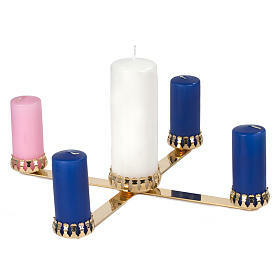 This item is an advent candelabra in golden brass. It features 3 purple candles and a pink one with a diameter of 5cm; they are for the 4 advent Sundays. Every Sunday you light one more candle while the white candle, the biggest tallest one, must be lit on Christmas day. The central candle can have a maximum diameter of 8cm while the other 4 candles can have a maximum diameter of 5.5cm. It can be decorated with a pine branch wreath or other garlands or even simply put on the altar.